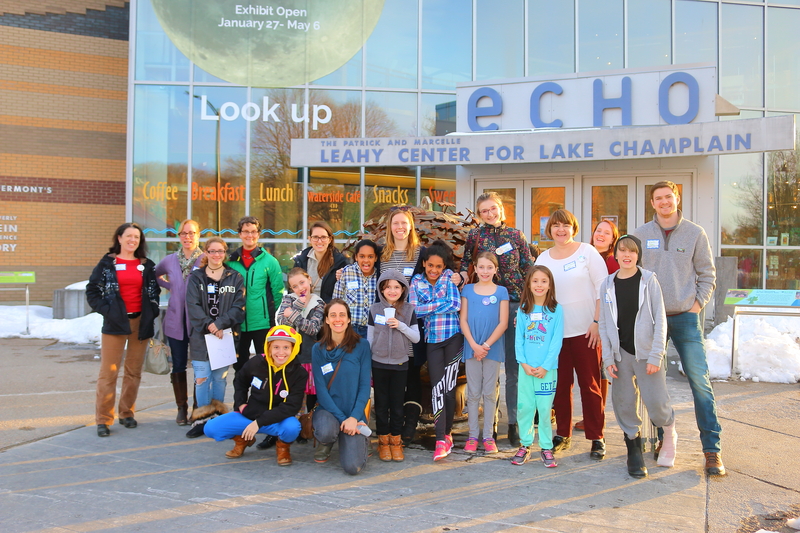 On Thursday March 22, more than 200 mentors, mentees, and program coordinators from mentoring programs across Chittenden,Grand Isle, Franklin, and Addison counties attended the 2018 ECHO Community Science Night, hosted by ECHO, LeahyCenter for Lake Champlain. ECHO is Burlington’s Lake Aquarium and Science Center, located right on the waterfront of Lake Champlain in downtown Burlington, VT. Once a year, ECHO closes to the general public at its normal time, and then promptly welcomes in youth and their mentors for an evening of exploration and discovery. 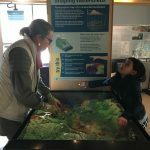 This annual event provides mentor pairs from northwest Vermont with the opportunity to explore each of the exhibits, engage in activities such as a scavenger hunt, spend quality time with one another, and have the chance to meet other mentor pairs from other mentoring programs. “It was great to see both mentors and mentees expressing their curiosity about ECHO’s different exhibits. I walked around to check in with each of our pairs and caught them eating, learning, laughing and having fun. It was also neat to see this within the larger context of mentoring, seeing two hundred people together at ECHO that otherwise wouldn’t have connected without their mentoring programs. And there was food! I just hope all of our pairs enjoyed the event as much as I did!” – Stephanie Ball, Spectrum Mentoring Program. ECHO’s E-Team played a huge role in the overall success of this event. 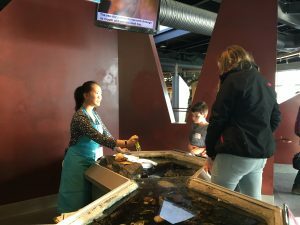 The E-Team, a group of freshmen and sophomore High School students from across Vermont, are celebrating their 11th year anniversary. They are guided by Noella Krakowski, Education Programs Coordinator at ECHO. Community Science Night featured the E-Team guiding mentors and mentees through the building with a designed scavenger hunt. 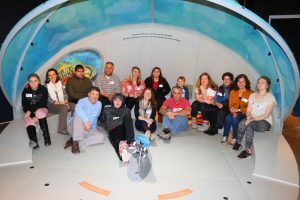 They also invited guests to explore, create, and launch their own paper airplanes; showcased the Champlain Sea Tank; and challenged mentors and mentees to design a scribble bot to create their own art. The featured exhibit this year was “My Sky,” an exhibit made in collaboration with NASA (National Aeronautics and Space Administration) about the universe, that invites children and families to explore the Sun, the Moon, and the stars together. There is a skate park that allows kids to explore the Sun; a Moon Dome that allows kids and families to experience the patterns of the Moon; a child’s room that lets you observe the Moon and the stars; and a backyard camp-set that lets visitors observe the Moon, the stars, and the Sun together. 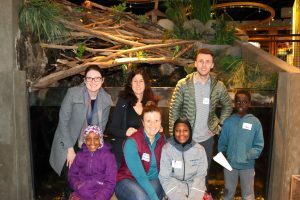 This year, mentor pairs from 10 different mentoring programs came out to Community Science Night. Programs represented include: Big Brothers Big Sisters of Vermont, Crossroads: Where Cultures Meet, Essex FriendCHIPS, Grand Isle County Mentoring, King Street Center’s Junior Senior Buddies, Milton Mentors!, Spectrum Mentoring Program, Starksboro Mentoring Program, The DREAM Program, and Watershed Mentoring. The ECHO Community Science Night is made possible by ECHO’s Open Door program. The Open Door program works to make access to ECHO’s services and resources affordable to all members of the community. It is through this program that mentor pairs can visit ECHO at a discounted rate at any time by using their Mobius Mentor Discount Card. 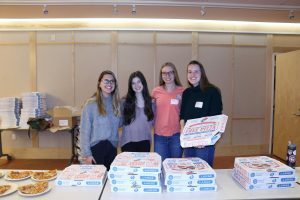 We want to extend a huge thank you to ECHO for hosting, the E-Team for leading demonstrations and ensuring the success of this event, Dominos for donating pizza, Rhino Foods for donating cookies, and the UVM Pi Beta Phi volunteers who served food to the participants. To view photos from the event, check out our Facebook album here.